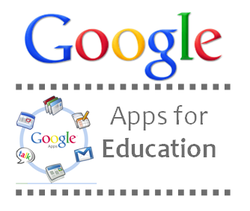 In 2013, St. Joseph School partnered with Google to begin using Google Apps for Education. Google Apps for Education allows schools to create their own private space within the Google universe. This private space is hidden from the rest of the world, so it becomes a safe and secure place for students to use Google applications like Docs, Calendar, Mail, Video and more. Students learn keyboarding and research skills using Internet sources in a new state-of-the-art computer lab installed in 2009. Classrooms are all equipped with two to eight computers, with a twelve station-writing lab and a five-unit mobile laptop lab in the middle school. Interactive technologies include SMART Boards in grades five to eight, Promethean Boards in grades three and four, and Turning Point and Active Expressions response systems available to grades 3-8. Middle school students explore photography, video, and digital media through the elective program. Software ranges from sequential ordering of data to basic web design. Instruction is through lecture, modeling, multi-disciplinary projects, and cooperative learning. Beginning in fourth grade, benchmarks are set to monitor progress in keyboarding.